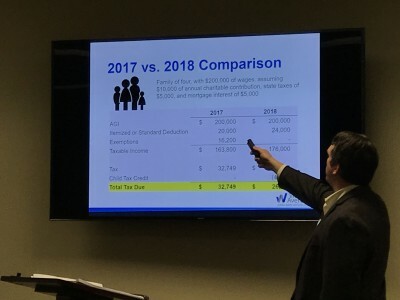 Huntsville, AL - On May 2, 2018, Jared Sharp, CPA, Service Area Leader of Warren Averett's Huntsville Office Tax Division, presented, "Tax Reform: What You Need to Know." This event was sponsored by the Community Foundation of Greater Huntsville as part of the quarterly Philanthropic Advisors Network meetings. Mr. Sharp discussed how the recent tax reform legislation will impact clients’ charitable giving and tax strategies. What are some of the opportunities for charitable giving under the new tax reform? Because of the increase in the standard deductions, donors may not have the same tax incentives to make charitable deductions each year. However, if charitable giving can be “bunched” in one year and distributed over many, the taxpayer would be able to use the itemized deduction in the year he or she gives to charity and use the standard deduction in the other years. A Donor Advised Fund (DAF) is a perfect solution to accomplish this tax strategy. For example, if a couple regularly donates $5,000 a year to their favorite charities, they could instead choose to donate $15,000, representing three years of charitable giving, to a Donor Advised Fund. The couple would be more likely to benefit from itemizing their deductions in this year of the gift and then using the standard deduction in the years thereafter. Donating to a charity directly from an IRA after age 70 ½ continues to be a great tax strategy for donors who may not need the extra income. This qualified charitable distribution (QCD) allows clients to satisfy their minimum distribution for the year while also excluding the distribution from their income. As part of the tax reform legislation, Congress suspended the Pease Limitation, which was an overall limit on itemized deductions for high net worth taxpayers, through tax year 2025. This will allow high-income taxpayers to take full advantage of their charitable donations through itemized deductions, rather than having those deductions limited at certain income levels. If you are interested in learning more the Community Foundation and the work we do to support philanthropic advisors and families’ philanthropic goals, please contact Stuart Obermann at stuart@communityfoundationhsv.org.